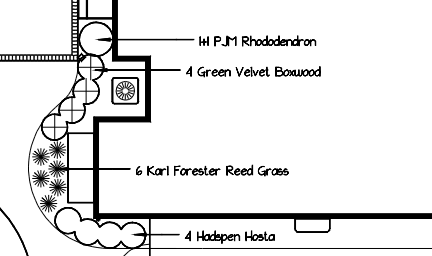 Just a few days ago, I posted the first snapshot of part of our design for the full landscape plan of the #newoldbackyard and discussed how I had planted one of the hydrangea plants that I had earlier last week harvested from a teardown on our block. Today, I'm sharing another look at part of the design - this time the southernmost section of new landscape beds that are adjacent to the rear part of our foundation. Of the plants that I dug out of the lot down the street (which...mind you...was invited by the owner! She told neighbors to go over and dig up some stuff before the bulldozers came in...) I managed almost half a dozen hosta clumps. Not sure exactly what variety, but all of them were variegated, so they're not Hadspens based on the photos I'm seeing online. I figure that's ok, right? Because, where I ended up putting them is right where these 4 Hostas were spec'd in the drawing above. I ended up digging up about four holes and put the clumps in some combination and then covered them back up. I mentioned that there was a lot of clay and here, more than any other spot in the #newoldbackyard it seemed could use some soil amendments. I know that before we put in the grasses and the boxwoods, we're going to have to buy a yard or two of mushroom compost and till it in place. I also planted the Disneyland Rose in a spot back here that we might have to end up moving now that we have this plan. Or...at least altering in some way. I quickly watered these new transplants, then we rushed off to something else. I'll try to baby these things for the next few weeks before the weather of the fall really sets in. Here's hoping that come next Spring, we'll have a few survivor hostas in this spot (and maybe even perhaps a fern, too!) that can give us a headstart on this part of the design.